Justin Bieber Betting Props - Casino Answers! Like the majority of the world(well, those with brains and taste anyway) I hate Justin Bieber. He’s one of the most annoying, nauseating prats I’ve ever seen – and that’s me censoring myself from what I really think. However I must admit I’m paying a lot more attention to Justin Bieber these days. When I visit TMZ and read his name I don’t just roll my eyes in disgust and quickly scroll down. What can I say? It’s fun being able to watch someones downfall in front of your very eyes and I can’t wait to see what crazy stunt he pulls up next. Hell, you can even bet on it! I have to thank the fine folks at Bovada for this one. I used to think Justin Bieber was only good for one thing – torturing the fine men currently incarcerated in Guantamo Bay, Cuba. But now thanks to his epic downfall this year, I actually have the chance to profit from it. Will Justin Bieber Check In To rehab on or before December 31st, 2014? Will Justin Bieber be Arrested in 2013? Will Justin Bieber and Selena Gomez get engaged on or before December 31st, 2014? The odds on all of these are quite high too – although shrinking as each day goes by, and Bieber does something even more idiotic. Let’s look at all of these lines one by one – and I promise these are real – verify for yourself at Bovada. You can only bet “Yes” on this one, and the odds are a healthy +1000 as of this writing. That means you bet $100 you will win $1000 if he checks himself into rehab prior to December 31st, 2014. Now this one is tricky. I mean there’s no doubt that at some point in his life he’ll end up in rehab – but by December 31st, 2014? He’s not even been picked up for a DUI…..yet. Look how long it took Lindsay Lohan to go to rehab – she even went to AA first. However Lohans stints in rehab only really started after the pressure she was clearly under with all the work she was doing. Bieber is already cracking a bit – the Anne Frank situation, drugs on his tour board, smoking weed. There’s a possibility that he’ll be in rehab by Dec 31st, 2014 but it’s going to require quite a fast downward spiral. If you think he’s going to sink faster than a Belieber in a swimming pool(aka like a stone), then head on over to Bovada and place your bet. The odds on this one are not surprisingly big at +2000, meaning $10 would net you $200. I just can’t see it. They’ve been on again and off again and both are young enough to know that it wouldn’t be good. The only reason it will happen in my opinion is if enough rumours came out that Bieber was gay. Faster than I run to get earmuffs when “Baby” comes on the radio, his PR company would be literally throwing the ring onto Gomez and coming out to make the announcement. This is one bet that despite the high odds I would avoid. Ahhh…now this is more like it, and the odds are still quite good at +500 at Bovada. Just look at some of the crap Bieber has pulled in the last few months, and the problems he has had. In 2011 and 2012 the bad PR issues were months apart. Now it’s every other day there’s a new Bieber story. Smoking pot, drugs found on bus, ready to fight a photographer, arriving late to a show, allegedly spitting on a neighbour. Honestly this is the best bet by far. Bieber is still young, he’s in a tough spot and he’s going to make stupid mistakes. He’s showing that he can’t handle the pressure too well anymore, and unless he takes a long time off – this is just going to continue. This is the bet to make. 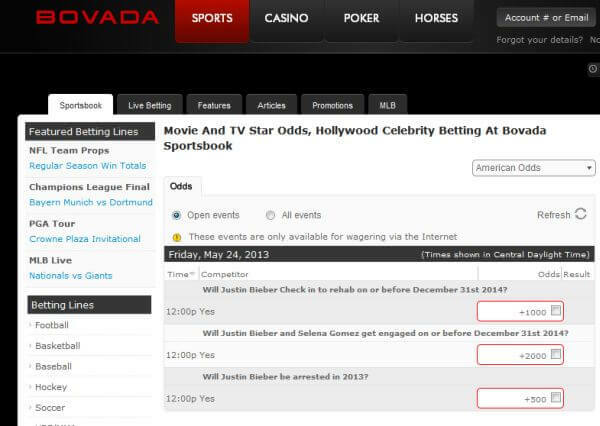 Bet Justin Bieber to be arrested for +500 odds at Bovada. Was Justin Bieber arrested? Justin Bieber going to rehab? Can you bet on Justin Bieber?